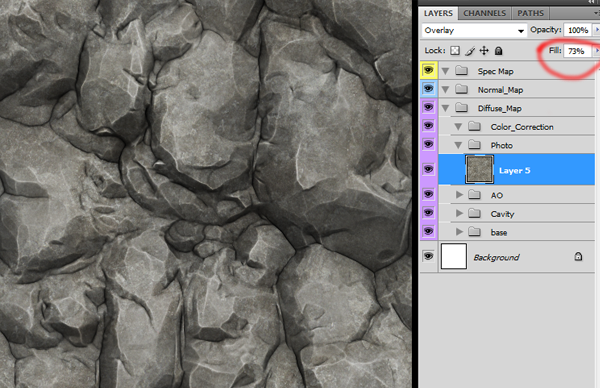 This tutorial will guide you how to make a seamless texture from ZBrush . Which can be used for low poly 3d models , both for the next gen or mobile . 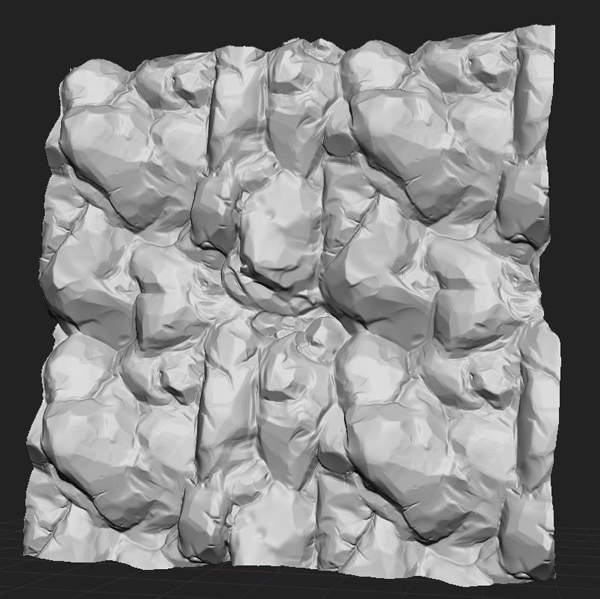 based on the zbrush sculpt above , we can generate some basic 2d map that will be used for texturing like normal map , cavity map , height map , occlusion map and photo texture . A. 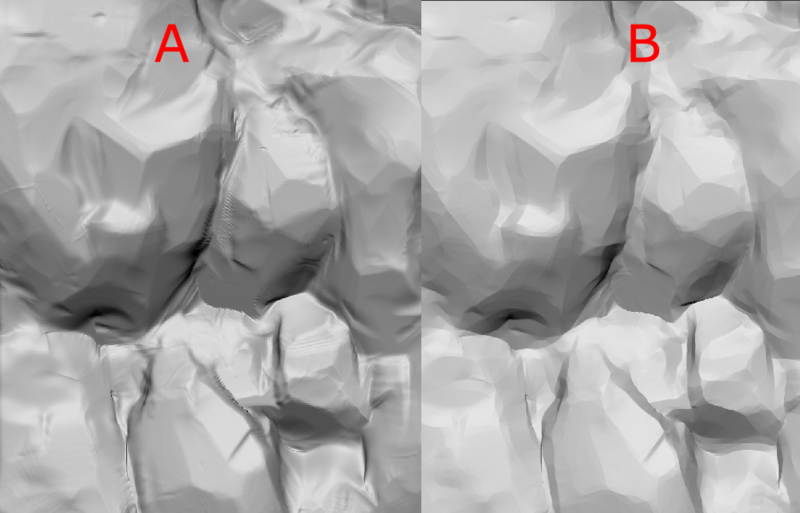 Normal map, can have many use than just creating a believeable bump, with the normal map we can use it for cavity map (image B), diffuse, etc..
B. Cavity map can be created from a normal map, games such as DOTA, Warcraft, has visible rock highlights edges that can be produced using cavity map. 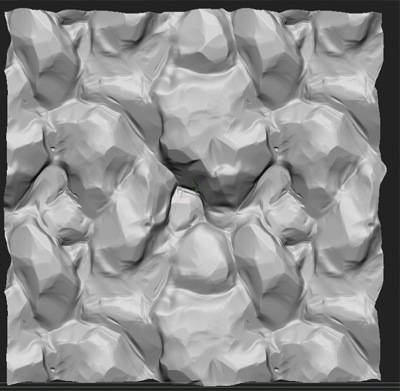 D. Occlusion map commonly used to strengthen the shape of the texture, giving definition and a bit of lighting for your texture. 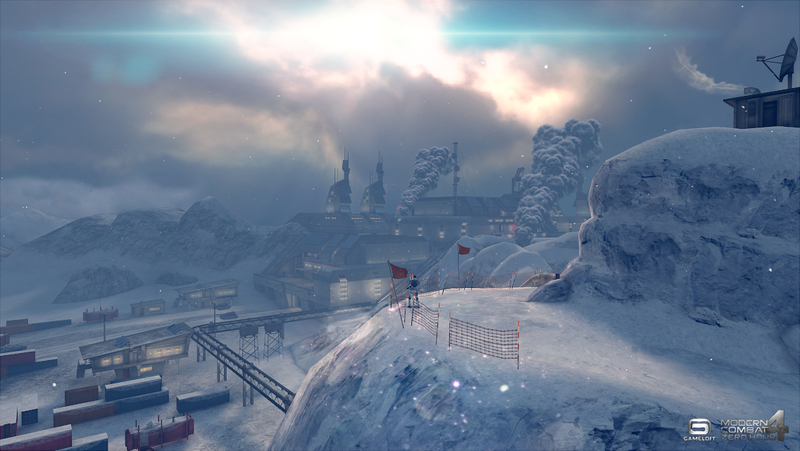 It is very widely used in the game to cheat the lighting effect, by baking it on texture. 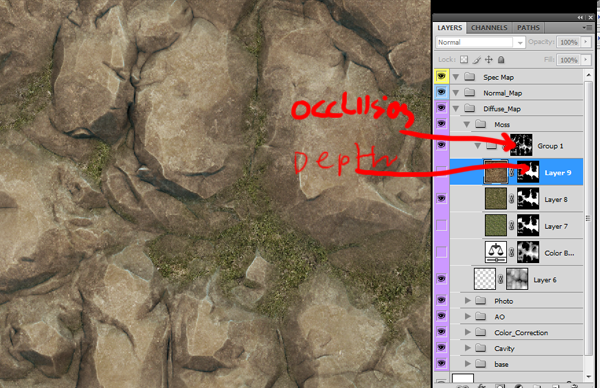 Occlusion map is also very useful for masking purpose. E. Photo sourced texture. 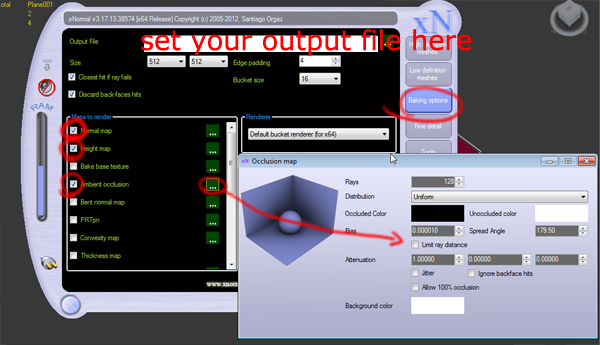 In this tutorial we will going to separate the use of photo sourced texture, because not all game will use it. especially for stylized and retro games. But we still have flexibility whether to use it or not if we place it on separate layer in photoshop. Let us take the example of some of the pictures below, the which is the most interesting and effective? why is that? 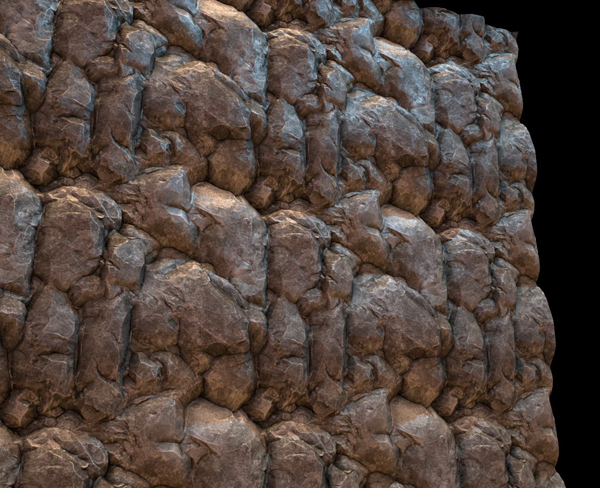 This texture have both detail and shape of the rock texture. while it seems to be right texture to be used. its not always the case. 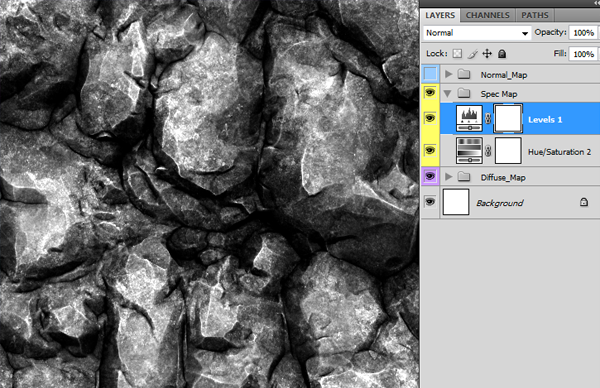 some of this texture might look too noisy when it seen from distance. this texture will only look nice when it seen from far away, and it will look chaotic when it seen seen from up close, and it will be hard to be tiled. since we will deal with a lot of obvious seam. 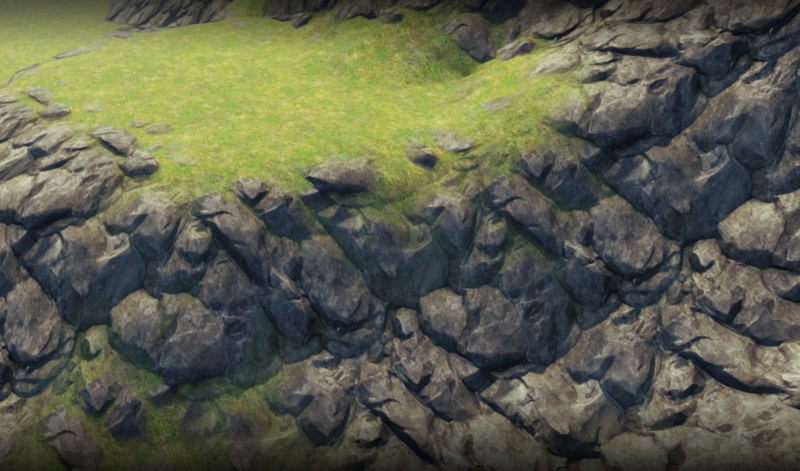 but this texture might be good for background objects like large mountains. 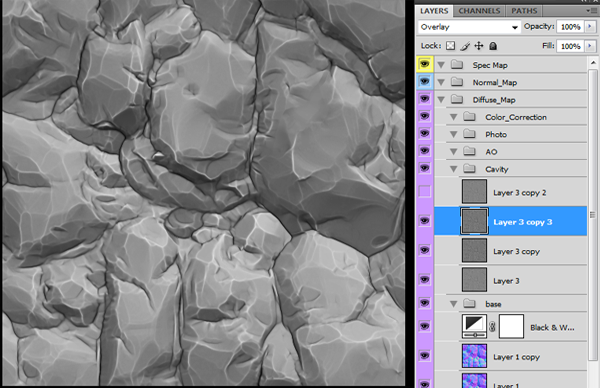 based on all these information we will make texture that looks good when viewed from near near and far. which is has good definition when viewed from up close and far away. Here is a comparison game with some distinct styles like uncharted vs Dota or World of Warcraft. While in warcraft prioritize in low frequency texture, which should look good when it seen from far away and low resolution budget, the medium frequency detail here is almost non-existent, and high-frequency detail is not present. 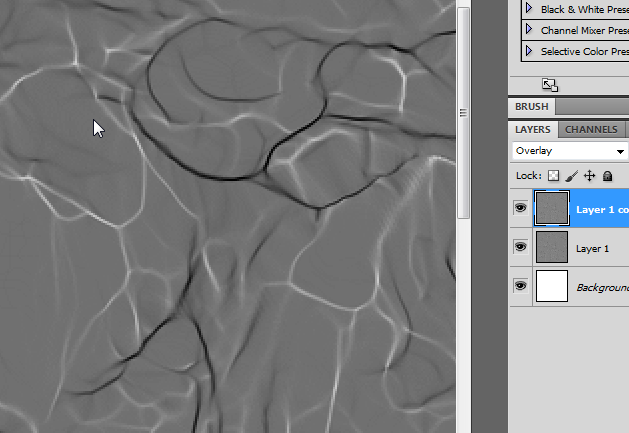 Both games use cavity map to enhance the definition and the shape of the texture. first step is to make a basic object in ZBrush that will be used for seamless high poly 3d Plane sculp , this time we will use available 3d plane preset in zbrush. 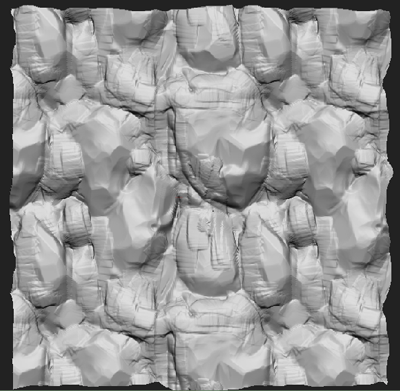 ZBrush Wrap mode is a function that can make automatic tiling while sculpting, which is useful if you want to create a pattern or tiling sculp. Well, let’s see what happens if we start to sculp the Plane3d using this function. The image below shows the differences between Plane3d without wrap mode (Figure 1) and the wrap mode (Figure 2) where the stroke automatically connected to the other side. now we know how to make tiling sculp, but there is one thing to remember before we start to sculp the actual plane. As we see on the picture below, the plane loses its shape, and it will create texture seam on its edge. like the picture below. 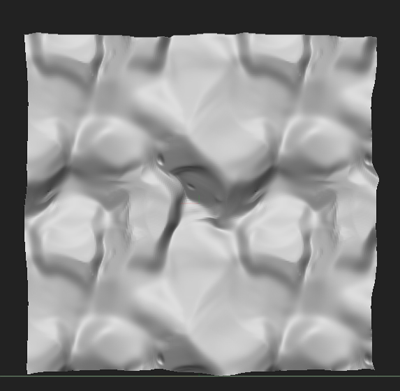 So what should we do in order to avoid the texture/sculp seam? 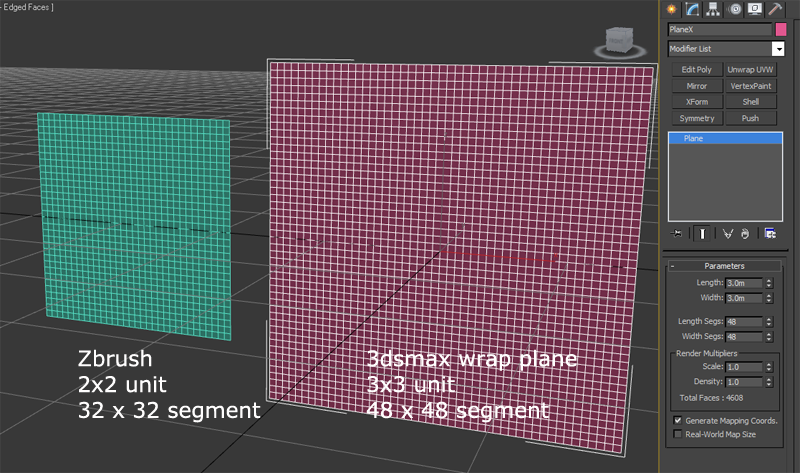 the easiest way is to increase the size of Plane3d itself to create padding/extra border. Lets say , in Wrapmode as described earlier is repeating the pattern on each zbrush 2×2 unit size it means that if we just need a 3d plane that larger than 2×2 unit. to keep geometry consistency I would reccomend you to create it on external program, we want each polygon respect the size ratio of 3d plane itself. the image below is the example on how to create larger plane from external 3d program. make a 3×3 unit 3d plane, or meter with 48×48 Segment, position the new plane on: 0.0.0,turn it 90 degrees facing forward (like zbrushplane) and export the new plane using Goz or existing exporters. 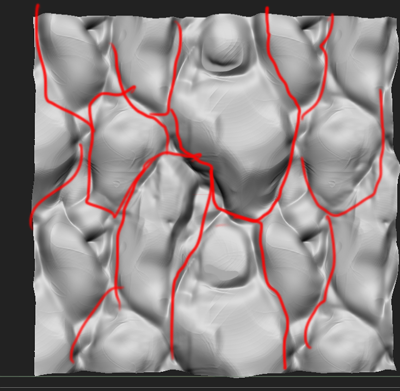 Now lets try the sculting process again this time we will use that larger plane instead of default zbrush one. 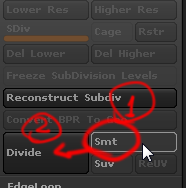 Select Divide then SMT turn back (this is very important to remember) otherwise you will loose the smoothness when you go to subdivision 5 to 1 or back and forth. the difference now you can see the extra padding on your tiling, with this guarantee will not get unwanted seam. Again keep in mind, any brush that we use have to wrapmode on and that including smooth brush. For those who already feel confident zbrush sculpting you can skip this section, however if you still need to know I will show you the sculpting process in this section. 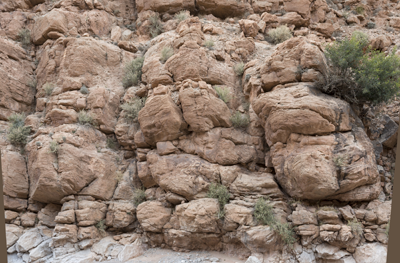 Trim Smooth Border :can be found in “Light Box” – “Brush” – “Trim” – “Trim Smooth Border” This brush is very useful to create natural looking rock shape without too much hassle. 2. 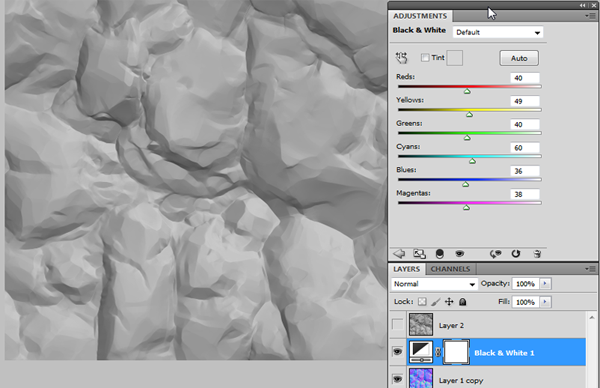 Subdivide it to level 3 or 4 and use Trim Smooth Border smooth,flatten and smooth brush to polish the details a bit. 4. In this step we can begin detailing with trim smooth border, you have to be patient and spend more time on this, zoom in, and slowly sculp some interesting shape. 5 .continue to all the segments, and occasionally see the whole shape. 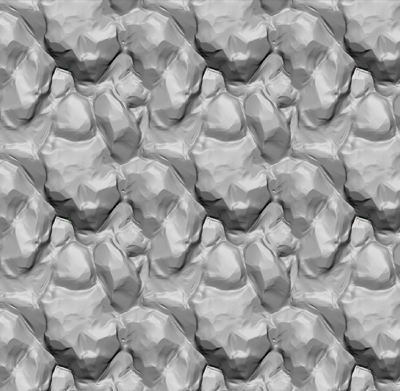 6. you might need to check the whole look and perhaps try to fake tiling it in photoshop to see the result, This is a preview of pattern would I get if using this model. If you see that the dark contrast in the image that we can immediately. in the picture below I tried to reduce the obvious pattern in some areas. 8. I use claytube to fix the pattern, then redo the polishing step again. 9 now we got slightly more natural pattern and start do the detail part like the picture below. after we acheive the result we wanted , we can actually sharpen the details and give more “rocky” characteristic on your rock by using claypolish function. What is claypolish?claypolish will detect some important edges in your model, then sharpen it and smooth out the surfaces that are not important, it is very useful for cleaning up the brush stroke very quickly. your 3d models so you will look more polished and contrasted . Below are the settings I use for claypolish, max 83 sharpness 27 times if the results are too sharp can be reduced figure. note : after you do the claypolish , zbrush will have some mask on your model, its imprtant to keep this in mind, you need to remove the masking ( by dragging ctrl+left click outside your model) to start sculpting again, otherwise some part will not affected by your sculp after you done claypolish. just to be sure. we will bake the sculp inide the 2×2 unit size plane. if you don’t have it ( or accidentally deleted it), you can create a new one in zbrush by selecting the preset again in ztool. There two ways to bake from hipoly to lowpoly, one way is using features Zbrush 2.5D then the other way is using xnormal. both method have advantages and disadvantages, but let’s try the second way first,in this tutorial we will use xnormal since the procedure is quite straightforward and consistent. 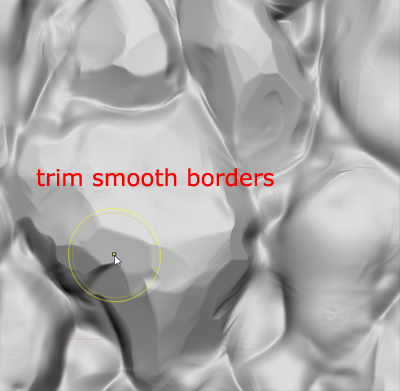 change the smooth mornal from exported normal to average normal. 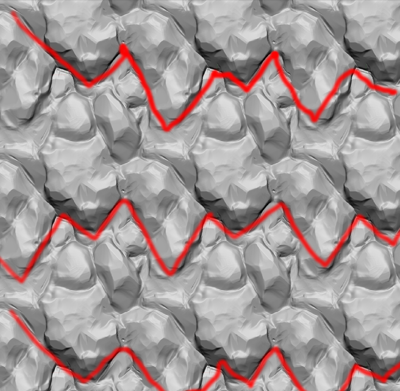 default zbrush normal will be read as faceted normal in xnormal, we need to make it as averaged so we won’t have faceted geometry in our bake result. Now go on, let’s do the baking process. on ambient occlusion click the green dots bar to go into further options, turn off the limit ray distance, because sometimes it makes the results of baking function becomes too white. after all steps is done now simply click on the generate map button. There are some options for this tool such as swizzle coordinates. you can try to switch between y+ to y- , usually if you see green is up , that means y is – otherwise y is + . 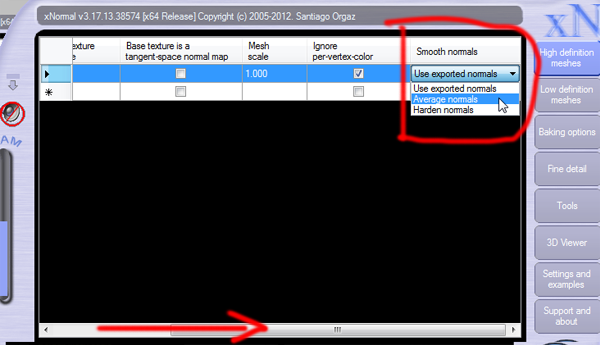 you need to change the Method to EMB to get the right cavity map. 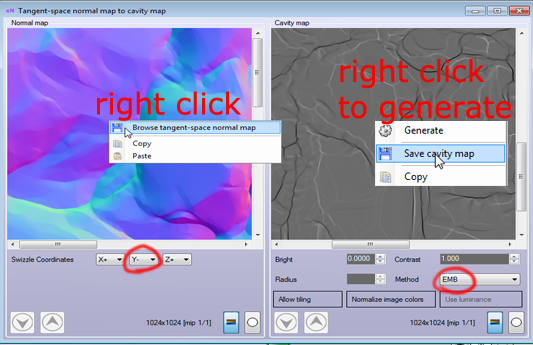 now you can either copy and paste your normal map here, or using open image, this time I ll just copy and paste my normal map to this tool. tip : Try to use the Grouping and layer color to keep it organized. we will use our baked Normal_Map as the base map for this texture there are two ways to obtain grayscaled base texture from our normal map. go channels and click only the green part of this layer, we will see grayscaled version of our normal map with the lighting from top. 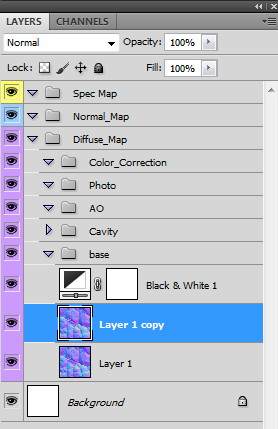 Or, use the black & white adjustment in photoshop , this way we can adjust the intensity of each color produced by normal map to black and white. so that we have control over which direction the light we want in our texture. 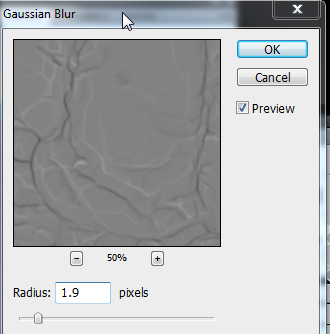 Cavity Intensity can be modified in photoshop , you can also duplicate it and use overlay mode to intensify the strength. Photo sourced texture could also be an option, you cn either use it or not, also depending on the style, here we use it as overlay layer and its lowered its FIll. Use color correction and color screen to manipulate the colors and the contrast . Don’t be afraid to do some experiment on this step. 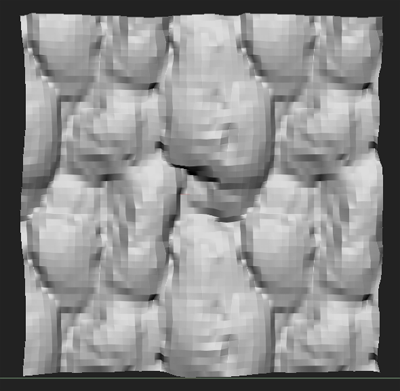 Depth texture can be used for masking, it would be even better if you can combine this mask with occlusion map. 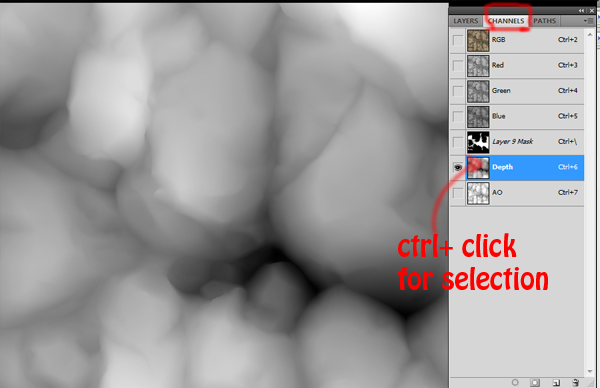 The trick is to copy and paste your image depth and occlusion in the alpha channel. 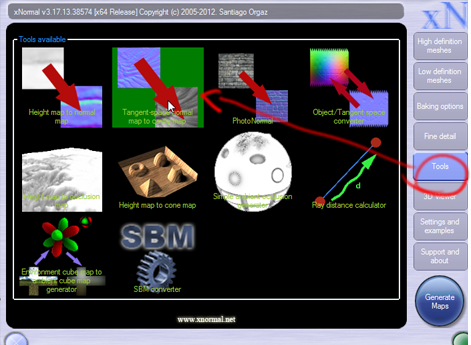 this is also the basic idea of blending shader that being used in most recent game engine. 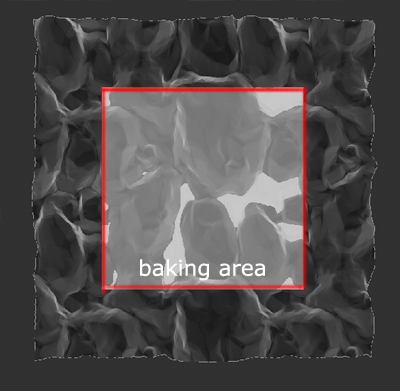 This group is used to store a normal map result which we have made it ​​earlier. to do this go back to xnormal, and go to heightmap to normal map tool. 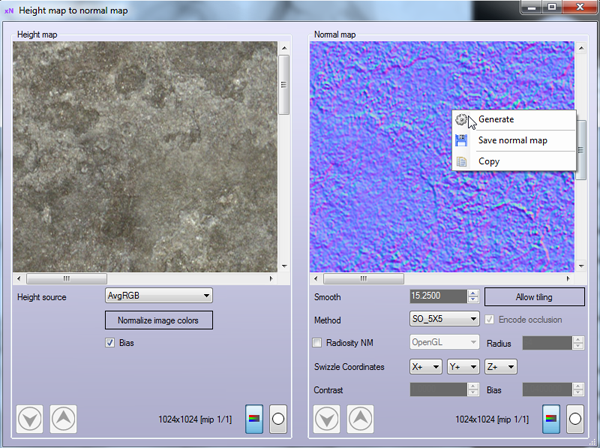 Insert photo texture in the left column, right click and generate in the right column, then copy or save the normal map. 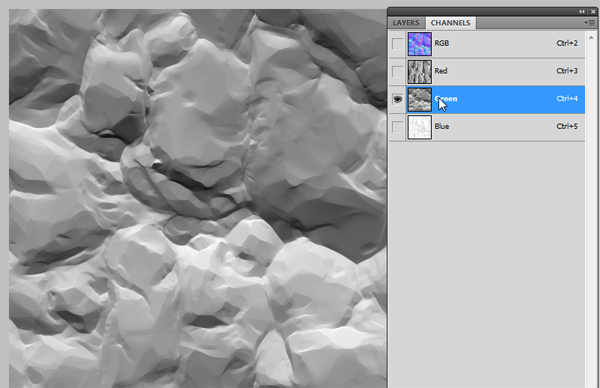 Put the generated noise normal above the original normal, and change the blending mode to overlay. now save each group to destined file. 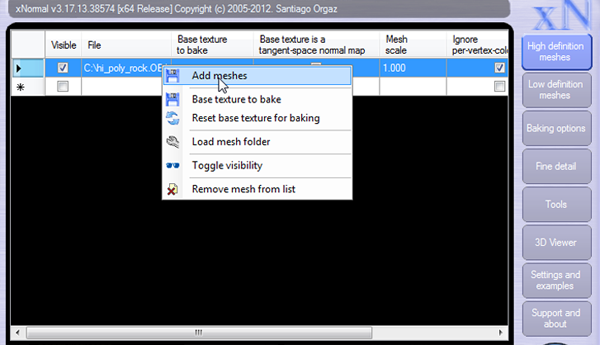 – to save the texture as spec_map : make spec map visible then save the map. 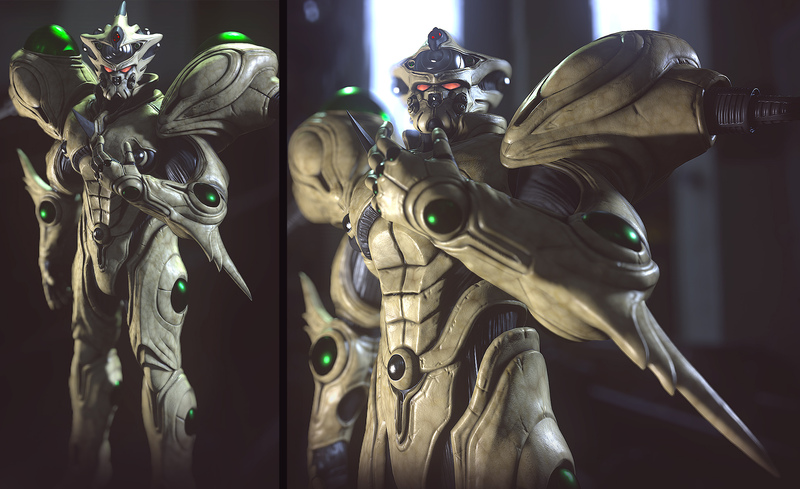 now we have 3 files , which is normal, diffuse, and spec that will be used for 3d rendering. 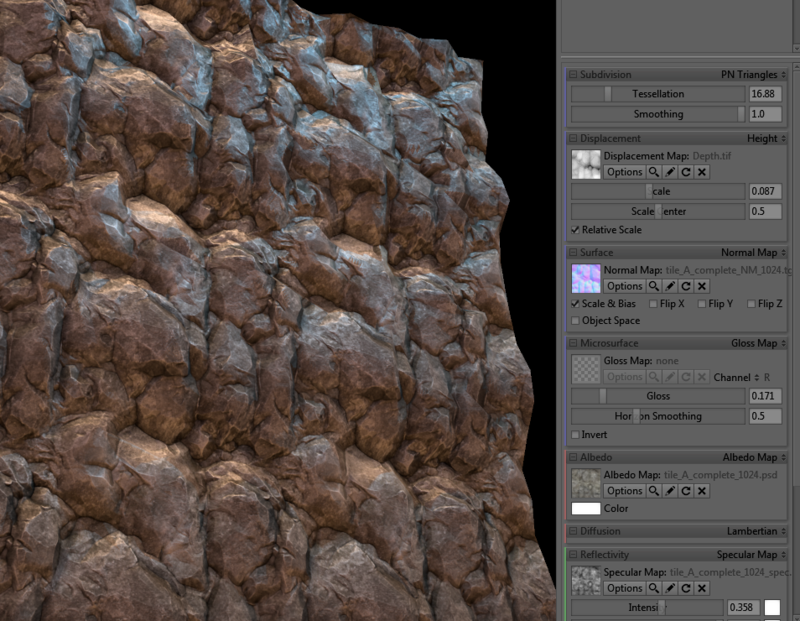 also do not forget the depth that can be used for the displacement map or texture blending mask. 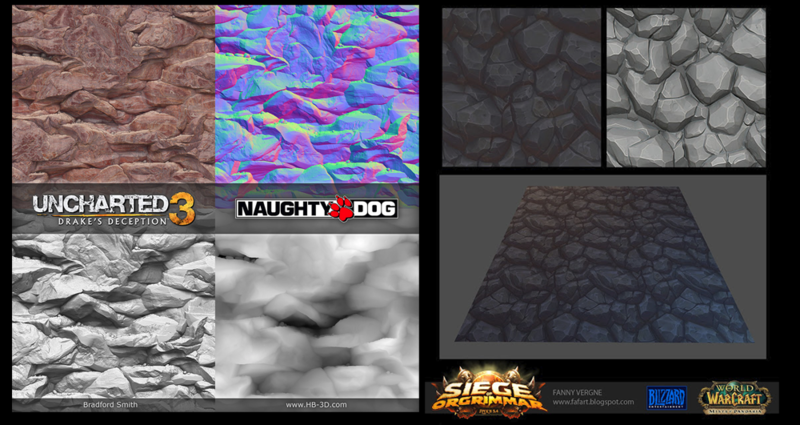 once all texture set, we can see it in game engine. by placing it on the materials. 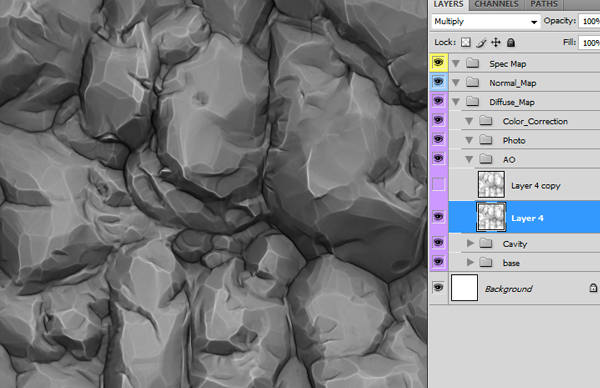 I hope this document helps to give you more clear idea on how to create tiling texture with zbrush. Great tutorial! Why have I never seen this before now? Sorry if this is a kind of braindead question but what did you do to achieve that look in Unreal 4? Is it not displaced in the same way as Marmoset? Hey thanks!!!!! Really usefull. I allready sort of figured things out myself but your tutorials really helped!!! Thanks for this. I have a question though. How do I paste the Depth and Occ in the alpha channel. When I do this. I get red. Also how do you get those black and white moss blends. Thank you so much! This is the best made tutorial I’ve seen online. I love that you linked other sites for more information. Your graphics and gifs helped tremendously. I love that you referenced different styles of making this kind of texture. This is the most whole–holistic?–tutorial I’ve ever seen, because it doesn’t just talk about the technical side of this method (which you already did amazingly) but also the relevance of the final product to game engines and the style you’re going for. I really appreciate this. Thank you again. I create a 3d plane , activate the wrap mode , export the plane , create in max a new 3×3 plane , export this new big plane , import in zbrush as a new subtool (append or import?) and the size of both planes are always the same , no extra padding.(???). I feel some kind of weird but “double sided” was disabled and i couldnt see the new plane till I rotate the scene. But now , the issue is that i paint in the bigger plane but i cant see the small plane as in your gift to guide me during the draw. Also , superb tutorial , just messing around with the import options. I’ve followed the tutorial twice now, but it seems that I’m never able to make it tileable. No idea what I’m doing wrong, shame, the tutorial was well written. 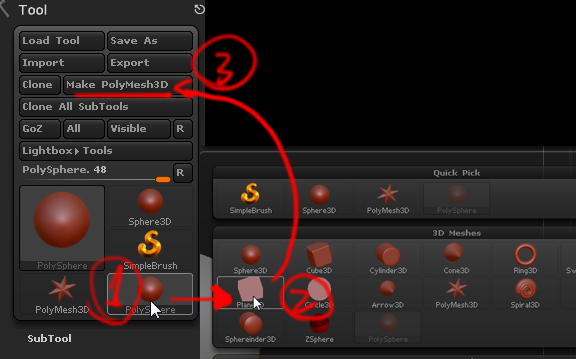 3. use original zbrush Plane when baking the mesh. I have no clue Arif, I wish I knew. I’m pretty sure I did all of those things. Except I did both planes in 3ds Max, but I don’t see why that should be a problem? Perhaps it has something to do with symmetry? It seems like you active symmetry on all axis? In the gif right above “the difference now you can see the extra padding on your tiling, with this guarantee will not get unwanted seam.” you draw in 4 places at the same time. This is a requirement, right? I didn’t do that, only on one side. I didn’t use symmetry the first time around. However I used an Alpha and DragRect, not sure if that means anything. I suppose there is nothing left to do, than to try again : / Maybe 4th time is the charm ey? Hey, did you use only vertex blend to achieve that result in the Unreal 4? 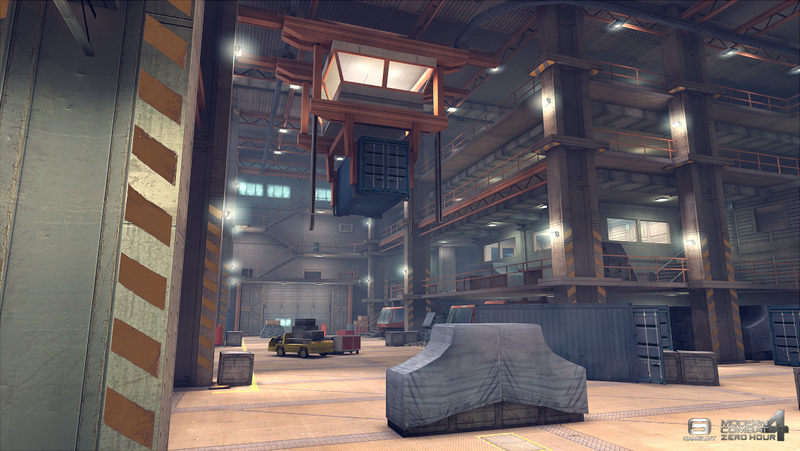 Or did you use some kind of height blend using the heigh map as well? Does the material have any displacement what so ever? 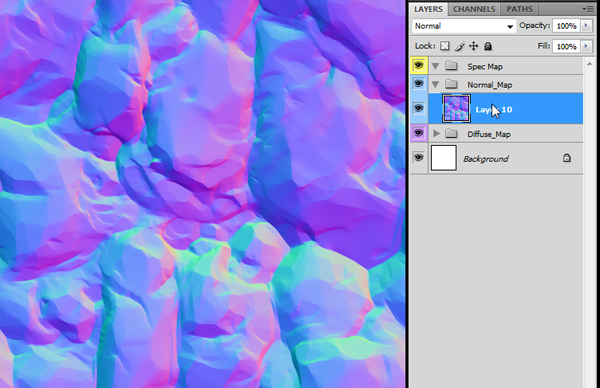 Or is that only the normal map? 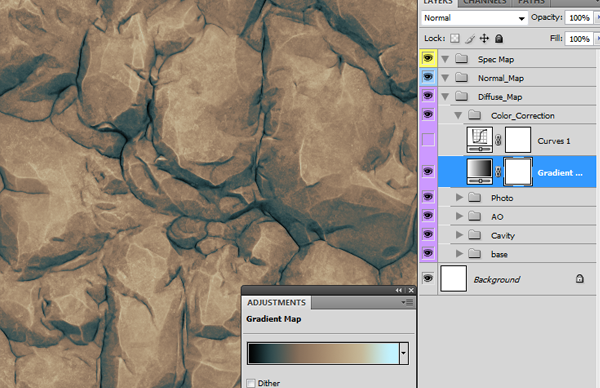 I’m creating textures for a game’s map editor mod. (Cliff and water normals) I need to use surface>NoiseMaker tool to get some realistic look on both of em but it always breaks seams. I’ve tried to generate noise with a seamless noise alpha map in NoiseMaker but after I adjust a lil bit same thing happens again. Is there a way to create seamless random global noise on my plane? 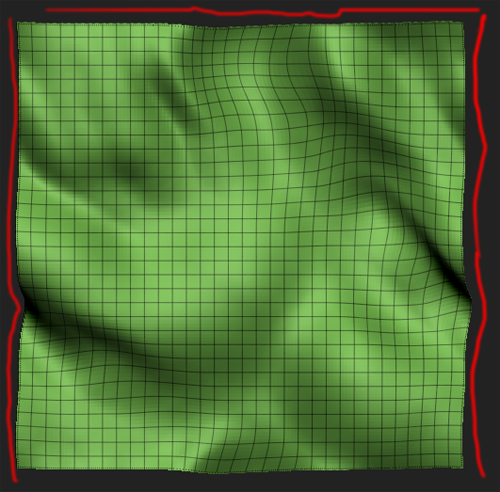 you dont create random global noise in zbrush, as it can be done in other software such as photoshop or SUbstance Designer, you have much more control over it in those softwares than in zbrush. This question has been asked before, but it never got answered. In the section where you create a large plane, what do you do with it in Zbrush? Do you keep both planes as two separate sub tools? Or do you only use the 3×3 large plane? smaller Plane is for baking, and your original plane reference. just export smaller plane to either 3d application, xnormal, or Substance Designer. Is there any way to have a better preview of which area is your actual tile? 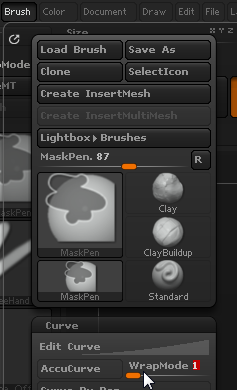 Also i assume zbrush will only wrap stuff in that default 2×2 size, no matter what kind of mesh you have? This is a superb tutorial, really helped my step up my game for texture creation ! Wow,nice artwork! thanks for that tutorial bro!